The Spring 2018 exhibition in the Qualcomm Institute's gallery@calit2, PERFORMING CODE, includes performances and an exhibition featuring the work of musician/audiovisualist Shelly Knotts, an artist who is active in the live coding community. 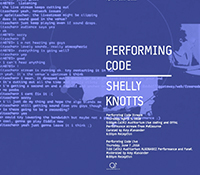 This Spring, the gallery@calit2 presents "Performing Code," an exhibition and series of performances featuring the work of Shelly Knotts, a musician and audiovisualist based in Melbourne, Australia who is active in the live coding community. Live coding is the practice of writing code live in front of an audience, usually in the context of creating music or real-time visuals. Live coding investigates performative coding as a means of addressing "liveness" in computer performance. But a broader concern is making more transparent the processes by which humans create and improvise algorithmically. In addition to her live coding work, Knotts' research and practice addresses improvisation and collaboration in networked music, exploring aspects of code, data and collaboration in improvisation. For January-May 2017 Knotts was Artist-in-Residence at the School of Chemistry at Newcastle University, where she explored ways to use sound to represent drug design in useful ways, developed an audiovisual sound installation, wrote algorithms to produce graphic scores for musicians and organized a chemistry themed "Algorave," in which Algorave artists were invited to make dance music and visuals from the data with which her team was working. In addition to performing at numerous Algoraves and live coding events, Knotts' current collaborative projects include algo-pop duo ALGOBABEZ (with Joanne Armitage), OFFAL (Orchestra For Females and Laptops), and live coding performances (Siseta Pealkiri) with Alo Allik. In 2017, she was a winner of the PRS Foundation Oram Award for innovation in sound and music. "Live coding has become an important practice in the digital visual and sonic arts over the past fifteen years, highlighting the creative and improvisational aspects of programming," said UC San Diego Associate Professor of Visual Arts Amy Alexander, who curated the exhibition. "Besides live coding and improvisation, Shelly Knotts's work also spans networked performance, scientific data visualization and sonification, and cyberfeminism. Given UC San Diego's strong research programs in computing in the arts and music within a cross-disciplinary environment, it's exciting to be able to bring Shelly Knotts's work to the UC San Diego community. " The panel discussion with Amy Alexander, David Borgo, Shelly Knotts, Curt Miller, Michael Trigilio and Pinar Yoldas will be followed by a live ALGOBABEZ performance and reception. "Performing Code" is open to the public from April 5 to June 8, 2018, 11 a.m. to 5 p.m. Monday through Friday. Gallery events are free and open to the public. The panel discussion and opening reception are open to the public, free of charge. Shelly Knotts is a data musician currently based in Newcastle, UK. * She performs live-coded and network music internationally, collaborating with computers and other humans. She is studying for a PhD in Live Computer Music at Durham University with a focus on collaboration in Network Music. As well as performing at numerous Algoraves and Live Coding events, current collaborative projects include network laptop bands BiLE and OFFAL (Orchestra For Females And Laptops), and live coding performance [Sisesta Pealkiri] with Alo Allik. Shelly has organized Network Music Festival since 2012. Knotts is currently in the process of relocating to Melbourne, Australia. She will be based in Melbourne during the period of the exhibition.